The new kitchen area fireplace is now finished and Tim says I can begin adding decorative bits to the mantel. Flooring will be done at a later date. I went through my photos and ordered an enlargement from a photo taken this past summer, to frame and hang above the mantel. Until that happens, I put a touch of Christmas cheer on the mantel. Evergreen bits were collected along our walk this afternoon, blown down from the trees during windstorms, taken home and soaked in vinegar and water to remove any bugs, then arranged here and there. There's nothing like volunteering to host a large party to make one look at one's home with a critical eye. Pot holders and hot mitts tend to show wear and tear quickly, so I bought a couple of new ones that I'll use the night of the party for the first time. While looking for the pot holders, I spied the racks of Christmas-themed tea towels and succumbed to temptation. The bird print is a dark grey-green. I was away overnight Thursday for a professional development conference on the mainland. "Taking Making into the Classroom" was the topic. It wasn't quite what I'd expected and I'm still thinking about how I might incorporate some of the ideas into teaching modern languages, if at all. While picking up a few groceries on Saturday afternoon, I noticed the fresh green wreaths on sale, so I picked one up. I hung it on the door and will add a bow to it soon. Saturday was a rather slow day - good after being away. We slept in a little, ate a leisurely breakfast, and I puttered away at a few things here at home without feeling the need to do too much. Our weather has been quite dreary. Mostly grey and rainy, with a few most welcome sunny breaks here and there. The forecast for next week looks much the same. It's good weather for sitting by the fire and reading. I re-read Winter Solstice once again, delighting in the descriptions of being snowed in, of good food, better company, and sympathetic characters. I have a couple more December books that I'm hoping to dip into once again. As I write I hear the rain spitting against the glass and the wind moaning around the corner of the house. A cup of tea is to hand, along with a mandarin orange whose citrus scent speaks of Christmas past and present. After the last swallow of tea, it will be time to prepare dinner: today a pork tenderloin with mushrooms, cauliflower gratin and roasted butternut squash. Hi Lorrie, Your dinner menu sure sounds tasty. :D How nice to have a kitchen area fireplace! I would love to have room for one, but truthfully, I'm sure it makes much more sense for you to have one because of where you live. It doesn't get cold here like it does in Canada; I think your kitchen will be super cozy now. I love your wreath and pitchers filled with greenery and your new tea towels, as well. Believe it or not, I re-read "Winter Solstice" every Christmas season. It's a great book to curl up with on a cold, winter's day. Have you read "Shepherd's Abiding"? It's such a sweet story for Christmas. Have fun hosting your party and have a great week, Lorrie! Lorrie, I love the scent of fresh pine. Your fireplace is gorgeous! Thank you for the book recommendations. I need a wintry book to curl up with! You are very industrious! I have taken the day 'off' and enjoyed a walk in the rain and a little Christmas-wrapping-for-mailing. Your December books look good - it's nice to have a collection that one reads and re-reads. I am sure that you will enjoy this cozy new fireplace! I think that a home improvement project and a large party coming up are both fine reasons to buy a new tea towel. It's a pretty one too! I love your live wreath and dinner sounds delicious! Winter has finally arrived here. Yesterday was cloudy, today is very dark and as I type, the temperature is 15 C and feels very cold when we are used to extreme heat. A good day to stay home and crochet/cross-stitch. :) Congrats on your new fireplace. Sure will make things very cozy. Winter Solstice is one of my favourite Winter reads too. It's a comforting book! How very nice your fireplace looks, and I can imagine you will be finding lovely things to decorate it. Your mantle looks so fastive. I just finished the latest Jan Karon book it was nice to be back in Mitford. Who needs to read with delicious blogs like yours! Thank you for the vinegar tip. It may be too late for me, but I will write it down for future reference. I found notes written to Christmas 2017 last night and that has proven helpful. My wreath man came by yesterday and I without $ to spare. He’ll be back at the end of the week and I’ll be ready, Hope that the sun shines there for you soon. Endless dreary days are dispiriting, though you are handling them well. A lovely cosy post Lorrie. I love the new fireplace, and your little pots of greenery (and the tip about the vinegar!) Cosy reading, cups of tea and the scent of mandarin oranges...perfect. How nice to have a fireplace in the kitchen, it will make the room even more cosy. I never thought to use vinegar like that, thanks for the tip. Welcome to Christmas. Very nice. You're easing gently into the Advent season and it's lovely to see the small loving touches appearing around your home. Looking forward to seeing more next time, Happy Mosaic Monday. The fireplace and mantle look great. I'll need to try that vinegar and water trick. You are so right about getting inspired because of hosting. I probably should throw out some pot holders here. Have fun getting ready for your event! I would adore a kitchen fireplace! So special. Your tea towels are nice, and I especially like the bird one! I'm working on decor, mostly using greens (both faux and real) and white lights! Lorrie - is this a new header for your blog? It is so evocative of the Season - well done! Your wreath has such a variety of greens - we are waiting for our daughter to arrive this weekend before we get to decorating - can't wait! In the meantime, I am enjoying Christmas music while I catch up with all my blogging buddies. Have a cozy week! Your touches of Christmas and your new fireplace look lovely and very cozy. I think I need to read Winter Solstice! I hope you see some sunshine soon. Your fire place looks very nice. I like the touch of Christmas you added. You will have fun decorating the new mantel. I am curious as a former English teacher to see how you will incorporate Making into a study on Modern Language--and you have me thinking what would I do? having not even taken your workshop, I might consider quilt blocks pieced together with words, paper as the medium. Sunday dinner sounds so really good. How wonderful to have a fireplace in the kitchen, Lorrie. I had one in my last house, and loved it so! I'm so happy to hear that we both love Rosamunde Pilcher. Her books always make me fall in love with the characters and the countryside, and I'm always sorry when the story ends. Winter Solstice was definitely a favorite, and one that I should re-read. I hope you have a wonderful week, Lorrie. I hope my comment came through ok? If it didn't ... just wanted to say your fireplace looks great, and your recent dinner of a pork tenderloin with mushrooms, cauliflower gratin and roasted butternut squash sounds delicious. A cosy fire burning in the kitchen with its lovely surround lookd just perfect as does your dinner of pork tenderloin with its delicious sounding accompaniments. Your fire place looks so inviting. Can't wait to see what picture you picked to hang there. Thanks for the encouragement to get new potholders. I tend to use them until they are falling apart. 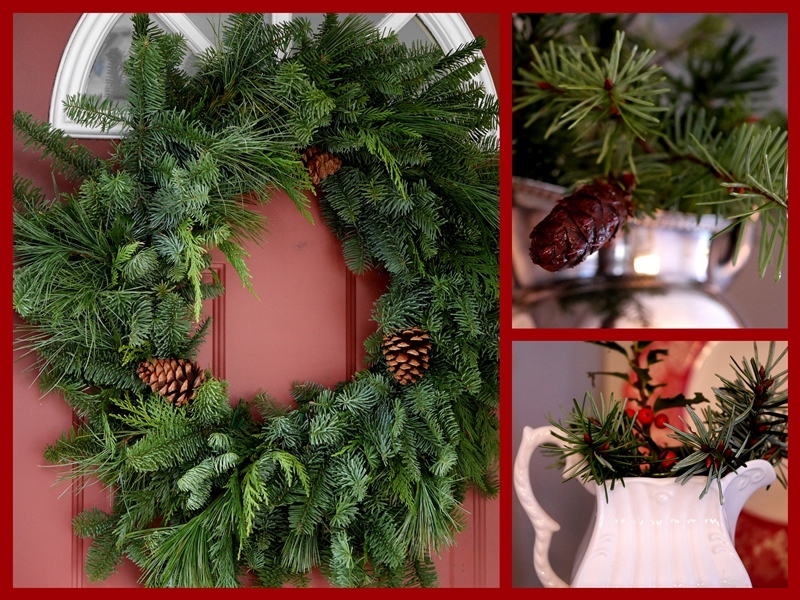 Loving the evergreens right now and picked up wreath on sale today also. I will use it as a centerpiece on my table with candles in the middle. Happy preparing for Christmas. Your fireplace looks great! I can picture you sipping a cup of tea by the fire. All my interior Christmas decorations have been put up, but I'm still looking for some outdoor decor. Your new fireplace is beautiful, Lorrie. I like decorating for Christmas a little at a time and savoring each new addition. I also save new pot holders to use when company comes. My everyday ones have seen better days, but I can't seem to discard them, as they are still usable. A "kitchen area fireplace" - that really speaks to me, Lorrie! And it's lovely. Especially with the wind and rain you're enjoying (at least *I* am enjoying your poetic description of it). Wonderful fireplace -just the thing for this chilly weather. We've had so much rain over here - are you not getting as much as we are. We are getting over 5 inches ever few days - I forget to empty the rain gauge and it overflows at 6 inches. Great for staying indoors and decorating a bit, and enjoying a cup of hot tea. Your evergreens do make the spaces brighter on wintry days.